In which I make an effort to fill some of the gaps in my knowledge of the science fiction and fantasy published before 2000 (or “in the 1900’s,” as my daughter would say, but that just makes me feel old). 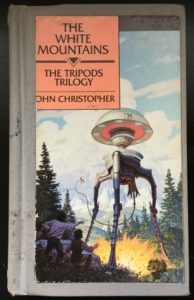 Cover: The Tripods Trilogy by John Christopher. A enormous dome atop three articulated legs menaces two boys while drawing a third boy toward the dome via a retractable tentacle. 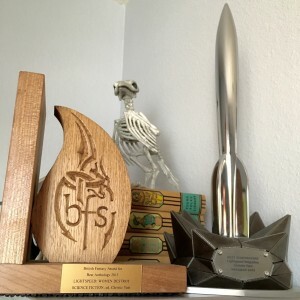 I was lucky enough to have a fourth-grade teacher who loved science fiction. Fourth grade was the last year in which teachers read to the class as part of the daily curriculum. (This was around 1980.) 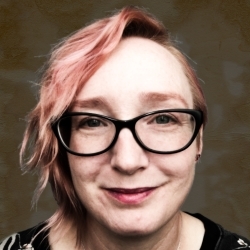 That year our teacher read Ray Bradbury stories (“The Fog Horn” and “All Summer in a Day” being particularly memorable from that time), Madeleine L’Engle’s A Wrinkle in Time (of course)–and The White Mountains by John Christopher. When I spotted an aged copy at the library book sale, I picked it up, whereupon it accumulated nostalgia and dust for two years. I found it the other day, and needing something to read, decided to revisit the book that had so frightened me and helped to shape my early understanding of science fiction. My memory of it was confused, at best. I suspect that I conflated it with the later books in the series, which our teacher may have also read, or maybe I picked them up on my own. I remembered the books being far-future science fiction, absolutely terrifying, and largely taking place in a snowy mountain range, with a solitary protagonist in ever-present danger. Instead what I found was a post-apocalyptic story set in the current time, a return to a feudal society after the fall of human civilization at the hands of the enormous, robotic Tripods, who now rule through mind-control via the mesh metal “caps” that are placed on every person coming of age. No one knows where the Tripods came from, whether they were made by humans or arrived on Earth from somewhere else—but capping brings an end to curiosity, a confident knowledge of one’s place in the world, and a social harmony that makes the presence of the Tripods a thing that most people neither object to nor fear. Will, our protagonist—his name likely being symbolic—is starting to question the necessity of capping as he has just lost his closest companion, his cousin Jack, who has been capped and has joined the society of adults. Will in his grief and loneliness meets a Vagrant, a type of man whose bond with the Tripods didn’t take, leading him possibly to madness, but certainly making him an outcast in a society that functions in complete unity. This Vagrant calls himself Ozymandias, and his cap is a fake that allows him to travel without suspicion. He convinces Will that his fear of capping is valid and reasonable, and tells him that there is a society of free boys and men who have refused to be capped living in the White Mountains, who he could join, if he has the courage. Will makes the decision to flee before his capping, leaving his family and future behind, and inadvertently teams up with his boyhood antagonist, Henry. Together they leave the land (England–a discovery to me, but maybe obvious to those who know the place), and cross the channel into France, where they adopt a third member of their party, a young man with an inventive mind who they call Beanpole as they can’t decipher his accent (it’s really Jean-Paul). When Will falls ill, he is taken in by the nominal ruling family and nursed back to health, separated from his companions and maintaining the cover of being an average, if adventurous, Tripod-compliant boy. The three must escape the feudal enclave—where Will must part with Eloise, a girl he has grown close to, who will soon be offered up as a sacrifice to the Tripods and will live out her life in service to them, wherever it is that they abide—and outrun, outsmart, and survive the Tripods that have picked up their trail. It was not unusual for literature of the time to have little in the way of women or girls as capable of adventure as the boys, and I tried to bear in mind that such books were written specifically for boys (we girls were meant to be reading Little House and Trixie Belden mysteries—which I happily also did); even so, I did find it odd that there were absolutely no girls or women in the entire world with curiosity and strength of will equal to three pre-teen boys who could reach the free people in the White Mountains. If I were to see a reboot of this today, I think Henry would make an interesting Henrietta, and curious and defiant people would not be limited to a single gender. The prose in The White Mountains is formal, but simple and evocative, and the diction never gets in the way of the action. Even now I found I didn’t want to put it down, and having forgotten most of it in the intervening decades, I was eager to discover what happens next. The tension in the Tripods’ pursuit was as chilling now as it was then, and the strange traditions around Capping Day were fascinating and creepy. Will himself grows and changes in productive ways, at one point realizing that he has treated Eloise with terrible disrespect and deeply regretting it. I’m glad this is part of a trilogy; there are simply too many unanswered questions about the Tripods, as nagging as an unscratched itch. In this book their unpredictable nature and unknown origin makes them ominous and terrifying, but if I didn’t believe that answers might lie ahead in the second and third books, I think I would leave this one unsatisfied.